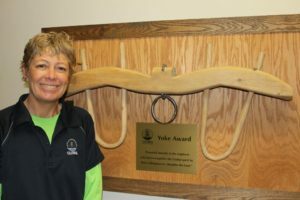 Renee Gowdy Receives Global's Yoke Award - Global Diving & Salvage, Inc.
Once a year, we take a moment to recognize a single Global employee who best represents the “Global spirit” by their willingness to shoulder the load. We are pleased to announce the 2015 winner is Renee Gowdy, our Estimating Group Manager in the Marine Construction division. The origin of the Yoke award stems from Global’s earlier years when we all did more with less (just like today). We wanted to find a way to recognize our employees for their hard work, going above and beyond, and pitching in to help get a job done. So we bought a goat yoke on eBay for $60, sanded the paint off it, and secured it to a board. Funny how traditions start.